Mangroves serve as a shield for the embankments and provide natural defence against tidal waves and floods by reducing the energy of the waves hitting the coast. However, as changing climate patterns and anthropogenic pressure began to threaten the mangroves in Sundarbans, 142 villages decided to take action. They replanted around 25 million mangrove trees over 5,500 hectares. This move from the villagers is not surprising considering the destruction cyclone Aila unleashed in Sundarbans in 2009 is still fresh in their memory. Cyclone Aila caused extensive damage to large parts of India and Bangladesh, killing scores of people. Reportedly, about a million people were rendered homeless, too. Sundarbans is a cluster of low-lying islands in the Bay of Bengal, sprawling across the Indian state of West Bengal and Bangladesh. It is a unique deltaic system formed by the confluence of Ganga, Brahmaputra, Padma and Meghna rivers opening into the Bay of Bengal. Border areas, where the land gives way to water, are ecologically important for they provide habitat for varied biodiversity. Sundarbans is a meeting place for salt water and fresh water and is the largest mangrove forest in the world. Perhaps, nowhere is the effect of climate change more apparent than in Sundarbans. The sea level is reportedly rising twice as fast as the global average and most of it could be under water in the next two decades. Storms, cyclones and floods are more frequent than ever. Severe cyclones have increased by 26 percent over the last 120 years. There has also been a significant surge in salinity in water. With increasing urbanisation in the cities near Sundarbans, the little creeks through which the rivers in Sundarbans connect to the fresh water resources started silting. “A critical minimal inflow of freshwater is required for this deltaic estuary to survive. It is difficult to say whether this inflow of freshwater has reduced, but salinity is definitely increasing. We can say that because some Stenohaline species (organisms, usually fish that can survive only in a narrow range of salinity of water) which should have been in the marine region are being spotted in the upper courses of the riverine creeks--an indication of gradual increase of salinity in these areas over time,” says Ajanta Dey of Kolkata-based Nature Environment & Wildlife Society (NEWS), that has been trying to restore the mangrove ecosystem in the Sundarbans with local communities. Not just that. The salt-tolerant species of mangroves have been found to increase while there is a decline in the less tolerant ones, she says. “The entire ecosystem thrives on a delicate balance between fresh water and saline water and this is having an effect on everything, everywhere in this habitat. Dominance of one species over another spells change in the entire food chain,” Dey adds. Restoring the mangrove system could have far-reaching impact in bringing stability to the entire biome. “There are three kinds of mangroves--the kind seen on the seaside of embankments with aerial roots; those which grow on the embankment sides and hold it together; and those on the inner side (landward) that consist mainly of grass, creepers and shrubs. Together they protect the coastal villages from cyclone, tidal surges, etc. This is now going to be even more important because of the rise in the sea level. Apart from that, the mangrove provide honey, shrimp, prawns, crabs etc. as products that sustain livelihoods,” says Ardhendu Sekhar Chatterjee of Development Research Communication and Services Centre (DRCSC), a Kolkata-based organisation working on sustainable farming. “We realised that there is a need to have conversation around mangroves. Sundarbans is about mangroves. Threats like degrading, deforestation, illegal felling of trees, encroachment are all happening and the only way out is to intervene scientifically and also engage with the local communities who are at the front line of these changes,” Dey says. Since 2010, NEWS has engaged with the locals in Sundarbans to restore the mangrove system through a multitude of ways, including ‘valorising’ mangroves. As a first step, we assessed what the site required--afforestation or restoration. Accordingly, some areas were assisted in protection, some others in regeneration; in some areas, seeds were planted while in some, nurseries were grown to be planted later. Species of mangroves were then selected. Dey informs that a majority of mangrove plantation programmes carried out by various government or non-government agencies have not worked because the most easily available species was chosen for plantation. “It has to be chosen taking many factors--like the slope, the species that grew there previously, the inundation level etc---into consideration," says Dey. "We consulted the elders to understand the trees that existed there originally. Studies were also done to know the existing species adaptable to the place. The plantation for each site was designed with the community--especially women--to suit local conditions,” she explains. Srimanta Dinda is a mangrove steward from Jogindrapur village in Patharpratima block in South 24 Parganas district in Sundarbans. He belongs to a village that used to witness hurricanes and the wrath of the sea two or three times a year. “After we planted mangroves, the floods are few and far between, maybe once in two or three years,” he says. 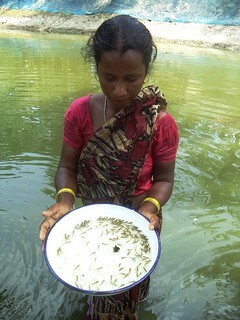 Dinda is among 500 mangrove stewards groomed by NEWS in the Sundarbans. They are committed to looking after the mangrove plantations by the communities and monitor their growth and survival. “Whenever someone disturbs the plantations in any way, I try to stop them or report them to the local project officer. Not only do I guard the forests, but I have started practising organic farming, vegetable and rice cultivation and fisheries also,” he says. Lack of livelihood opportunities, however, compel people to go back to the forests for fuel and fodder. “There have been instances where people have let their cattle loose and the mangrove saplings got eaten up,” informs Dey. Therefore, all interventions--such as introducing locally made chullahs that require 40 percent less firewood, encouraging them to cultivate babool trees for firewood, etc--had to be done simultaneously. Mangrove valorisation was done to increase the income of small, marginal and landless farmers from their existing livelihood opportunities in a sustainable way, through knowledge and training, so they are less dependent on the forests. For example, value chains on existing livelihoods with mangroves such as mangrove-honey, mangrove-crab, mangrove-fisheries, utilisation of natural resources for sustainable livelihoods etc. were created so people realise the place of mangroves in their lives so they feel committed to protect them. “Planting mangroves has benefitted us in a lot of ways besides controlling the floods. We are also able to cultivate our farmlands more times in a year,” Dinda signs off.